Specializes in pre-ferments and long fermentation process to nurture the taste and to achieve the full nutritional potential of bread using what the nature has provided to his baker. "Dear Tommy, Good morning to you! Writing this message while savouring you baguette sprinkled with mozarella cheese...simplest yet tastiest! If you don't mind replying, can I check with you re the term: sprouted bread? Came across this word lately as I googled for suitable food for eczema patients and the bread is strongly recommended. I read in your website that your bread all goes through tedious fermentation process to bring out the nutrients, enzymes etc of a bread. So is this also termed as sprouting the bread? Then I am on the right track as we are consuming your bread! Bravo! Well, although not daily as we make a trip to your shop from Bandar Utama once a week... Have a great day ahead!! Cheers!" Thank you for your question. I really like this when a customer writes to find out more about the food they eat. Sprouted bread is a bread made with sprouted wheat grains. Sprouted wheat are usually added to regular bread recipes in the form of whole grain, paste or dried powder as malt. But most of the content in the bread is flour. Flour is milled from non sprouted wheat grains. First, you might want to ask yourself, what happen when wheat is sprouted. To sprout grains, we need water to dampen the grain. During this soaking process, a significant amount of phytic acids (which is an inhibitor in most grains and legumes) starts to break down. Gluten in the wheat also gets broken down for better digestion eventually. I personally believe that consumption of high phytic acid products in the long run will weaken our body immune system because it inhibits our body to absorb 4 main minerals (iron, zinc, magnesium and calcium) which is fundamental for growth. Therefore, similar to sprouting wheat, flour also needs to have a significant amount of timespan in water. In making bread, the longer the fermentation process, the longer will the flour be soaked in water before we turn it into real noble bread. Fermentation is a process to cultivate taste in bread with yeast or natural leaven but also simultaneously soaking flour to breakdown complexity of nutrients for human digestion. I subject all my breads to a tedious process with preferments we culture in the shop, main purpose is to breakdown as much as possible the complexity of grains/flour. I have always say this to many people: If we do not respect the nature, the nature will harm us. So, respecting the fundamental of fermentation is my business. I have many customers facing the same problem as you with bread. Stomach bloating, eczema etc...I have a bakery today and I can tell you this is an alarming social problem. But don't panic and don't blame other breads. This social problem can be understood by reading social history, in this case, the social history of bread. Malaysia don't know so much about history I am talking about because the bread we know until today was introduced much later by the English after their post war industrialisation...so to say, our bread is already "modern". Everybody needs to go to work and build their country after war, so no time to make bread. Bakery also cannot supply the amount of bread a household needed. So build factories, make lots of bread in the shortest amount of time to feed the population. What population? The population of "baby-booms" after war. So these population of baby-booms ate a lot of "no-time" bread during economy growth. So i guess you can imagine how much mineral deficiency they already suffered. If a mother cannot absorb the minerals when she was carrying her baby, how can her baby be born to be full mineralised? And I guess, this is why ppl blame gluten. This modern disease of gluten intolerant has taken such a huge hooha. If gluten is so dangerous, all the civilisations that eat bread would have vanished by now. This model of industrialisation was entirely reproduced in Asia and hence Malaysia kena! The methodology in milling to bread production we know until today, is modernised already. Lastly, please don't just polarized on bread. Your daily stable is not ONLY on bread. Other foodstuff in our economy also suffered from similar disrespectful treatment that eventually will surface on our skins! In this case, A BREAD HAS TO BE GOOD TO THINK BEFORE IT IS GOOD TO EAT! So think about other food you eat also. My breads are very inconsistent. I constantly neglect the image that consumers form of bread, because I know is an image that would influence their taste. And I enjoy telling ppl that I am selling inconsistency because I have a point to make. GOOD-LOOKING BREAD IS NOT ALWAYS GOOD BREAD. This is the simplest of methods. Yeast is used directly in proportion of 1 to 3% (fresh baker yeast) by weight of the flour. The three mechanical kneading methods (PVL, PI, or PA) can be used, but remember that the intensity of the kneading is decisive for the taste of bread. This method that requires little preparation can reduce the time of bulk fermentation. It is to add in the "petrissée", the overnight dough, at a rate of 200 to 400 g per liter of require water. Fermented dough brings acidity resulting from fermentation, improve the taste of bread and the strength of the "petrissée". It is a process that can extend traditional fermentation time, this time allows the compounds responsible for the taste to be developed. It is characterized by the preparation of a mixture water and flour in equal parts, several hours in advance. The strength of the paste is increased. 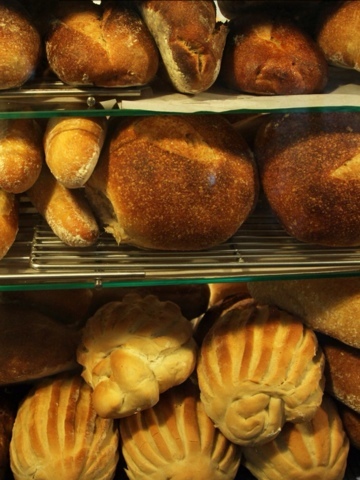 Breads obtained have a more pleasant taste and a pronounced character without acidity. The crumb is open and irregular. The course includes sourdough microorganisms acidifying. Fermentation takes place from wild yeasts and bacteria presented in the raw materials used which promotes acid fermentation. Baking sourdough gives the bread a taste asserts with acidity, a tangy smell and flavor full of characteristics. It provides a crumb that offers more resistance to the jaw, implying a longer chewing. - A liquid leaven cultured in a warmer temperature promotes the synthesis of lactic acid and the bread will taste mild acidic. - A paste leaven cultured in a colder temperature promotes the synthesis of acetic acid and the bread will taste more aggressive. The baking process of bread. The temperature at the heart of the dough passes fairly quickly from 25 ° C to 50 ° C. The yeast ferments the sugars degrading to carbon dioxide. This expansion causes gas rapid development of dough. This action develops until the internal temperature reaches dough of 50 ° C. Ferments are destroyed while it is the end of the fermentation. The dough continues to develop under the influence of heat, the alveoli (air-holes) are formed. To 70 ° C, starch swells with water, gelled and freezes the proteins (gluten coagulation takes place). At this stage, the bread has reached its definitive volume. The internal temperature of the bread does not exceed 100 ° C practically during cooking. In contrast, the surface of the bread, its temperature can reach up to 230 ° C and 180 ° C, reactions occur on caramelization and non-enzymatic browning Maillard which characterize the formation of the crust. Simple sugars situated on the surface of bread react and caramelized, a share of slightly bitter flavor colored and secondly a long series of compounds has varied odors. In the Maillard reaction, it forms compounds unfamiliar giving a brown color more or less intense. Formed compounds are partially drawn toward the outside of the bread by the steam leaving the bread during cooking. My passion for baking and the desire to revive the traditional values of craftsmanship in bread-making are the qualities that drive the essential spirit behind “Tommy Le Baker”. My offerings are carefully made to restore bread-making to the highest standards of the craft. And more importantly, to recapture the original flavours sought by masters of the tradition. Kneaded, shaped and baked on-site: the specially selected ingredients, time-tested methods, and unmistakable oven-baked freshness of Tommy Le Baker make every slice, loaf or piece of pastry truly a rare indulgence. Modern means of production, managed with heartfelt care for the final outcome on a fussy selection of flours, grains, seeds, butters and oils allow me and my artisans to offer you the best kinds of fresh bread likely to be found anywhere in Kuala Lumpur. In addition, where ever possible, I have been absolutely faithful to traditional recipes, while looking to support our local merchandisers and produce. In the culmination of my time-tested methods, the finest ingredients, and a desire to produce only the best you may find in my bakery-café traditional favourites from artisanal viennoisseries, pâtisseries, gateaux de voyage, to even long-forgotten French regional specialities. Come sit for a while here in my little bakery, surrounded by a plethora of the baker’s paraphernalia and instruments of his craft, and imbibe the sights, smells and tastes of the art of baking. Here, you may enjoy fine coffees, popular soft drinks, and the occasional soup servings to accompany breads and pastries fresh out of Tommy Le Baker’s ovens. Through my modest bakery, I hope you will join with me in my passion for good things, especially our breads: a significant part of culinary history that has brought joy, nutrition and life to mankind since time immemorial. My love affair with bread and pastries began when I headed off to France to study Linguistics and translation. When I eventually graduted in 1999, the asian economic crisis had hit and job opportunities were scarce. It was around this time that I discovered my passion for baking, so I went back to France and took up a pastry chef course in Gregoire Ferrandi, (which is part of L'Ecole Superieure de Cuisine Francaise in Paris) and later became a certified pastry chef. After, I also studied to become a certified boulanger (baker). I've travelled all over rural areas in France, discovering how breads are made across the country. After I came back to Malaysia, I became involved in the food industry in a sales capacity. After meeting so many industrial customers and seeing how they made bread, I started longing for the breads I used to have in France. 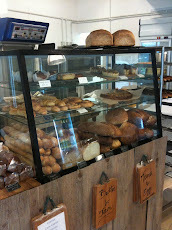 I opened my bakery, Tommy Le Baker in November 2010. Cakes and bread, copyright Tommy Le Baker 2010. Simple theme. Theme images by andynwt. Powered by Blogger.